Patient Michael Coleman receives a haircut from Jevonne Williams, volunteer stylist, as wife Judy Coleman observes. Even when recovering from major surgical procedures and lengthy illnesses, our patients don’t want their hair to look like its in critical condition. To help these patients look and feel their best, UCLA Health volunteers are now offering free hair services. 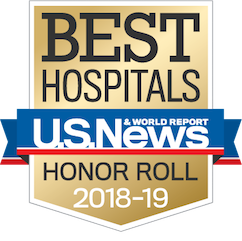 “We currently have five licensed cosmetologists who volunteer their time at Ronald Reagan UCLA Medical Center, UCLA Medical Center, Santa Monica and UCLA Mattel Children’s Hospital,” says Carey McCarthy, director of UCLA Health Volunteer Services. Ideally, patients should be able to sit in a chair during the cut and style. However, stylists are able to do basic trims on bedridden patients. To prevent any risk of cross-contamination or infection, volunteer stylists use new sterilized, disposable hair-supply kits with each patient. The kits are purchased through a generous grant from UCLA Health Auxiliary. 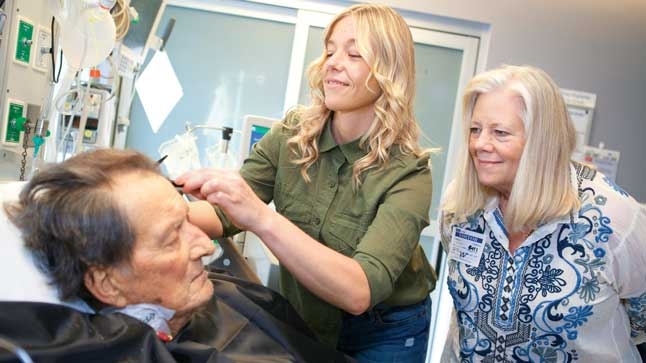 In addition to haircuts, volunteer stylists also do some light styling to help patients deal with problems that arise from being in the hospital. Hair matting and tangling is a common problem among patients who spend extended periods with their hair pressed against a pillow. To prevent this problem, stylists can either cut the hair short or braid it. “Ideally we’d like to braid long hair early in the hospital stay to stop knots and tangles from forming,” says Williams. To keep up with the growing number of requests, Volunteer Services is currently reaching out to local hair salons to recruit more volunteer stylists. One stylist who regularly volunteers came from our very own emergency department. Shiou Udagawa, a nurse at Ronald Reagan UCLA Medical Center, is also a licensed cosmetologist. Patients or their families can request hair service directly through Volunteer Services or by talking to a nurse. Staff members interested in volunteering can learn more at https://www.uclahealth.org/volunteer.